Sapphire for the first timers! The most elegant of all gem stones is a sapphire, and on your first wedding anniversary select a sapphire band. A band studded with sapphires has a charm that you can carry at all occasions and sometimes for daily wear. You can combine it with silver polished metals and even chose a different gem stone for an alternate setting. These Anniversary bands look pretty in wreath design and floral endings. Understand what your woman wants and gift her exactly that. 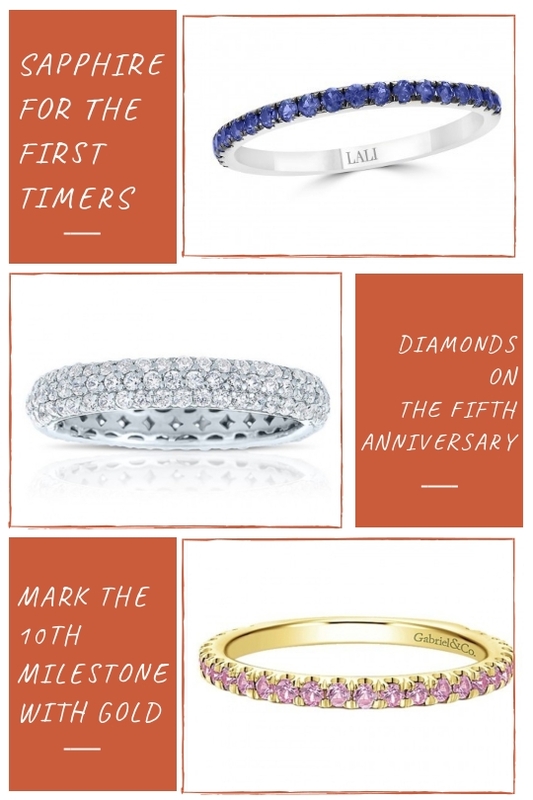 On the fifth year of your anniversary, get a diamond ring made suited to preference. Diamonds look beautiful on all metals, gold, silver, or titanium. Know what sets her apart from the crowd and gift a ring that will compliment her style. Diamond studded rings are mostly bands that vary in thickness and can either go all over or only on the top. But, you can also select the one that is a right fight for her finger and your wallet. A true milestone anniversary and your Anniversary Bands should be representation of that. Gift her a Gold band in yellow or white gold or even rose gold- what would make her heart skip a beat? They are timeless and have a scope of being designed in floral, celestial patterns.